Three days after its surprise eruption on May 2, the Chaitén volcano of southern Chile was still pumping out dense clouds of ash. The plume stretches east from the peak in this pair of images, taken on May 5, 2008, by the Moderate Resolution Imaging Spectroradiometer (MODIS) on NASA’s Terra satellite. The top image shows the region in photo-like true color. 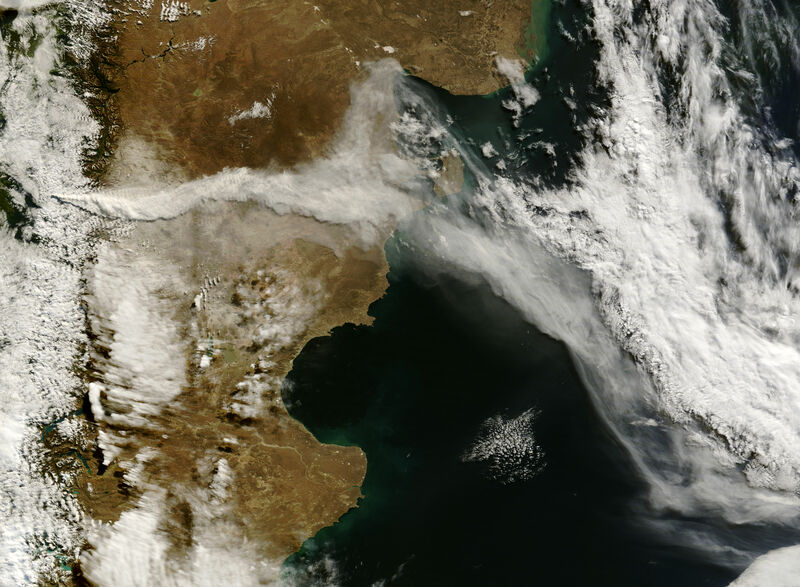 The ash-laden volcanic plume is slightly grayer in tone than the bright white clouds that are piled along the west side of the Andes Mountains in Chile. The plume rises above the clouds, casting a dark shadow on the cloud bank below it. The land surface south of the plume is blurred under a dusting of tan-gray ash. The plume itself extends over the Andes Mountains, across Argentina, and hundreds of kilometers over the Atlantic Ocean. The full extent of the plume can be seen in the large images. 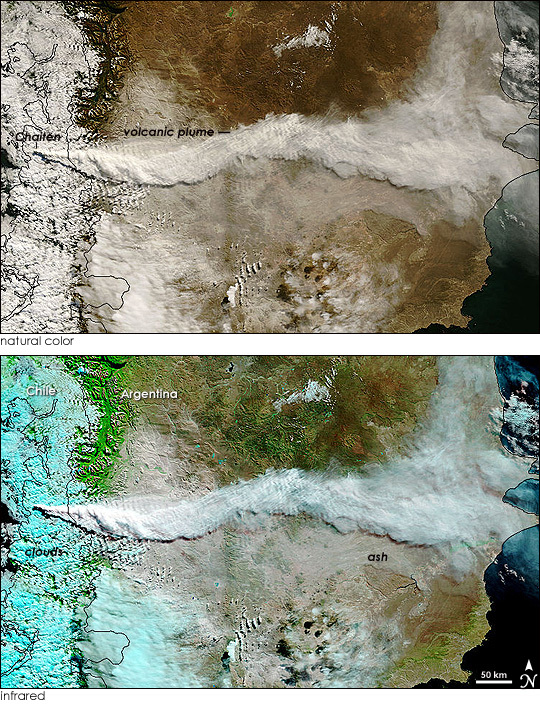 The distinction between ash on or near the ground, the volcanic plume, and clouds is more evident in the lower image. This image was made with a combination of infrared and visible light. Consisting of ice crystals and water vapor, the clouds are turquoise (ice) laced with white (water vapor). The warmer plume of ash and steam is white. The ash on or near the ground is a semi-translucent white. Hints of plant-covered land (bright green) are visible through the ash. Up to 15 centimeters (6 inches) of ash coated the ground near the volcano, contaminating water supplies and covering animal fodder, putting approximately 25,000 cattle at risk of starvation, reported Reuters. As of May 6, the eruption forced the evacuation of more than 5,000 people from two communities, Chaitén (10 kilometers from the volcano) and Futaleufu (100 kilometers from the volcano), said Reuters. The eruption that started on May 2 was unexpected because Chaitén was thought to have been dormant. Radiocarbon dating of the last lava flow from the volcano suggests that Chaitén last erupted in 7420 BC, plus or minus 75 years, says the Smithsonian’s Global Volcanism Program. The volcano has a history of explosive eruptions with pyroclastic flows associated with dome collapse. During an eruption, some volcanoes build a dome of lava. Eventually, hot blocks of lava break away from the dome, triggering a fast-moving avalanche of hot volcanic ash, gas, and lava, called a pyroclastic flow. On May 6, the volcano began to erupt with pyroclastic material, forcing the complete evacuation of the town of Chaitén, said Reuters. The initial eruption on May 2 sent a plume of ash and steam 10.7 to 16.8 kilometers (35,000 to 55,000 feet) into the atmosphere, reported the Smithsonian’s Global Volcanism Program. Additional images of the eruption are available in the Natural Hazards section of the Earth Observatory. NASA images courtesy Jeff Schmaltz, MODIS Rapid Response Team at NASA GSFC. Caption by Holli Riebeek. Three days after its surprise eruption on May 2, the Chaitén volcano of southern Chile was still pumping out dense clouds of ash. 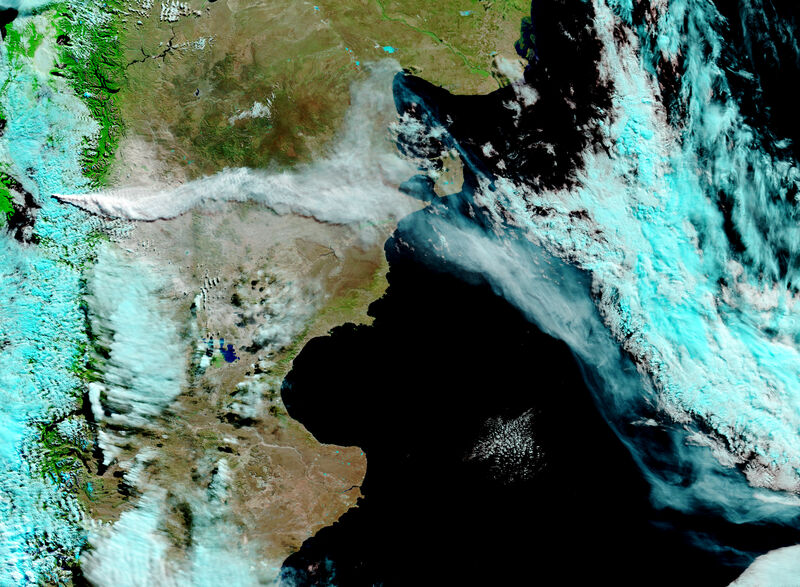 The plume extended over the Andes Mountains, across Argentina, and hundreds of kilometers over the Atlantic Ocean. Alvarado, I. (2008, May 5). Erupting volcano prompts new evacuations in Chile. Reuters published on Relief Web. Accessed May 6, 2008. De la Jara, A., Gardner, S. (2008, May 6). Emergency evacuation as Chile volcano spews lava. Reuters. Accessed May 6, 2008. Global Volcanism Program. Chiaten. Smithsonian Institution. Accessed May 6, 2008. Global Volcanism Program. (2008, May 2). Volcano News. Smithsonian Institution. Accessed May 6, 2008. Seach, J. (2008, May 4). Volcano News Volcano Live. Accessed May 5, 2008. Volcano Hazards Program. (2006, March 17). Dome Collapses Generate Pyroclastic Flows, Unzen Volcano, Japan. USGS. Accessed May 5, 2008.